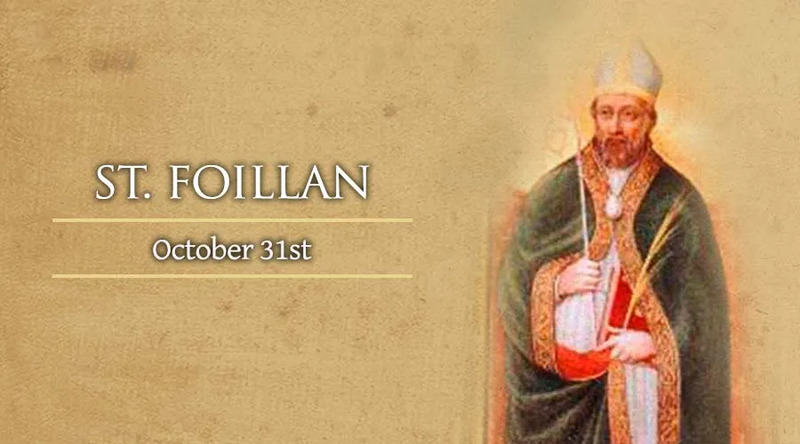 St. Foillan was born in 7th-century Ireland and was the brother of St. Fursey and St. Ultan. He joined them in England, where they were working as missionaries, and had established a monastery near Yarmouth. During a war between the Mercians and Anglo-Saxons, c.650, the monastery was destroyed and many of the brothers were killed, captured or dispersed. Foillan ransomed back his brothers and traveled to France, where they were welcomed and encouraged in their evangelization by King Clovis II. In 653, St. Foillan founded a monastery at Fosses in the Diocese of Liege and served as its abbot. He was a well-loved preacher and spiritual director, successfully evangelizing the people in the area, which grew into the modern town of Le Roeulx, Belgium. He also served as the spiritual director at the house founded by St. Gertrude. In 655, while traveling on Church business, St. Foillan was murdered by bandits along with his three companions.